Francis Ann Otton Crossland was born in London, England, February 8, 1826. She was the daughter of Ralph Churchill Otton and Elisabeth Kent Otton. As a girl, her chief occupation was making umbrellas. She attended the English grammar school for a limited time and later worked in an umbrella factory. Her meager earnings contributed to the support of the Otton family. Francis Ann married Junius Crossland in about the year 1841. She was only about fifteen years of age at the time of her marriage. Three of their children were born in London; namely, Amelia, Francis and Eliza Luff. Mrs. Crossland heard the gospel preached and was converted to the Church of Jesus Christ of Latter-Day Saints in her native land. The entire family was baptized on shipboard while crossing the Atlantic Ocean. In 1853, the Crosslands sold their possessions in London and left England against the wishes of her parents and seven brothers, and came to America. She emigrated to Utah with the Jacob Gates Company. While crossing the plains, a little daughter was born to them at Keokuk, a stopping place for the saints. This little girl, their fourth , was named Emma. At the Bear River, while Mrs. Crossland was still confined to her bed in their wagon, her husband died of Mountain Fever and was given a hasty burial in the wilderness of the plains. His grave is located near what is known today as Evanston, Wyoming. Mrs. Crossland came on in the Jacob Gates Company and established herself in the Seventeenth Ward, in salt Lake City, where she continued her trade of making umbrellas. It was also necessary for her to take in washings in order to support her four children. Washings at that time were done by hand, as there were no washing machines. This was very hard on her, as she was frail and having come from a well to do family in England, was not used to such work. It was during this time that the saints endured the “Grasshopper Famine”. She has often told the story of one dark rainy day when they found themselves hungry and without food, the famine having reached the stage where starvation seemed inevitable. That night the mother and children knelt down and prayed to the Lord for assistance. In the morning, the back yard was full of segos, which seemed to have sprung up over night. The family lived on these segos for several weeks and felt they had been greatly blessed. In 1858, Francis Crossland married William Adams, abandoning her little Salt Lake home and moved to Utah County. She took her four Daughters and went to the home of Mr. Adams to care for his three Children, and his aged mother, who was blind and almost helpless. It was not long after she went to his home that her oldest daughter, Amelia, who was then fifteen years of age, was married to John McDonald of Salt Lake City. When Johnson’s army arrived in the summer of 1859, it located at Camp Floyd. It was necessary for the army to have barracks built and Mr. Adams and his son William Jr. secured jobs from them. For his work as a mason, Mr. Adams received $3.50 per day and his son received a wage of $1.50 per day. For the first time since they came to Utah, the Adams family were able to have shoes and sufficient clothing. The soldiers also bought hay, grain, butter and eggs and other necessities that were raised by the people of Pleasant Grove. This brought prosperity to the early settlers of Pleasant Grove. But even with this apparent prosperity it is hard for us to realize the hardships of these early Mormon Pioneers. There were thirteen members in the Adam’s family, all living in a single room. It is indeed a mystery to know how they found sleeping quarters and enough food and clothing for all. Their main diet at this time consisted of thistles, segoes, and mushrooms that were gathered by the children. On May 14, 1859, a little girl whom they named Alice was born to Mr. and Mrs. Adams. On March 10, 1861, a second daughter, Annie Jane was added to their number. During these years of prosperity, the people of the settlement began to desire better homes than the crude shelters they had erected, and Mr. Adam’s talent as a mason, again was of value. A great many of the adobe buildings in Pleasant Grove were erected under his accurate management. William Adams then built a home for his own family, right beside the one room that had been “home” to them for so many years. The adobes that were used in the building were made by his own hands. Soon after they were settled in their new home, a son was born to them on February 22, 1865. This son, Francis Ann Adams first and only son, was named Joseph Hyrum. As the years went by, their children married and left home. The time came when Joseph was the only one from this large family at home with his parents. Mr. Adams began to fail in health and Joseph cared for their farm. Joseph was a great comfort to his parents in their old age. At last this son also married the girl of his choice, but because of the age and poor health of his parents, Joseph and his bride lived in part of the old family home, for some time. Joseph always stayed near his parents. Death closed the honorable life of William Adams, October 6, 1898. It closed a life of sacrifice and work, faithful always to the end. Intelligent and trustworthy in all his endeavors was Mr. Adams. Besides being ambitious in his work as a mason, he served eight terms as city treasurer and tax collector in Pleasant Grove. He also proved himself honest and trustworthy in serving as secretary of the High Priest Quorum for many years. 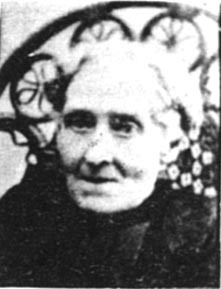 Mrs. Francis Ann Adams, after burying her second husband by the side of his first wife in the cemetery in Pleasant Grove, returned to the home he had built for her in her later years. Her children were very kind to her. Her son Joseph and his wife stayed near, building themselves a home at the end of the old Adam’s lot. Mrs. Adams was always a good neighbor and a willing church worker. She aided a great deal in caring for the sick of the settlement. She rode for miles, as a Relief Society worker, to care for the helpless, the sick and the needy. She was always active in the Church of Jesus Christ of Latter Day Saints and she served as a Relief Society teacher in the Pleasant Grove Ward from the time of its organization until her death. Taken from the records of Junius Banks. Deseret News, Thursday, October 3, 1931: Unknown Grave Believed that of Pioneer's Father. Pleasant Grove Woman Declares Parent Died Crossing Plains. Should any of the readers of “The Deseret News” know anything further about this lonely grave, I would suggest that they report what they know to “The Deseret News,” or write to the undersigned at the historian’s office. While thousands of Latter-day saints died on the long journey between the Missouri river and Great Salt Lake valley, scarcely more than half a dozen graves are identified, and the names of deceased ascertained, but whenever a new discovery is made of graves believed to contain the earthly remains of Later-Day Saints who crossed the plains in pioneer days, interest is immediately created in the minds of the general public as to who, is interred there and when burial took place. In the Journal History of the Church of Sept. 9, 1853, a list of the emigrants who crossed the plains in Capt. Jacob Gates company is given.